Take your kids on a city adventure in the heart of Jacksonville,Florida, and teach them all about how a big city works. Today we learned all about the Jacksonville Transportation System. How do people get around in big cities? Jacksonville has some interesting solutions to moving people. We parked in the parking lot right next to the Jacksonville Landing, and walked in and looked around. Wow, it looks like so much fun! They have a water splash fountain area right in the center of the gathering area for kids to play in! There is a great toy store and a food court full of a variety of great foods to choose from! Our transportation adventure has 3 stops, the Jacksonville Skyway monorail, the Jacksonville Riverside Trolley, and the Jacksonville SS. Marine Taxi! Stop 1 : The Jacksonville Skyway monorail system! It costs .50 per person to ride the 2.5 mile Skyway monorail back and forth as long as you wish! With 7 different stops to look at, it was an interesting ride. We boarded at Central Station which is an easy walk from the Jacksonville Landing. It is located right behind the giant Wachovia building, which is right across the street from the Jacksonville Landing. We learned all about change machines, coin operated turnstiles, read all the signs, and followed directions. Stop 2 : Riding the Jacksonville Riverside Trolley! For only .50 each person, we boarded the trolley and rode it all over town all the way over to the river at Memorial Park and back. We learned all about bus etiquette, and how you can pull the string to tell the bus driver that you want to get off. Fun! Stop 3 : Riding the Jacksonville Water Taxi! Board the Water Taxi at Jacksonville Landing and get a 15 - 20 minute boat ride stopping at 5 points of interest along the riverside, The Jacksonville Landing,Friendship Fountain, The Crowne Plaza, The Wyndham, and Jacksonville Municipal Marina. We saw helicopters flying overhead, and dolphins diving for their lunch in the river! The boat was big enough for 100 people so there was plenty of room and the views were fantastic. Cost: Adults $3.00, Children & Seniors $2.00, Children 3 and under free! They have group rates too, so you can bring your whole class, mommy club, or homeschool group for a great deal. 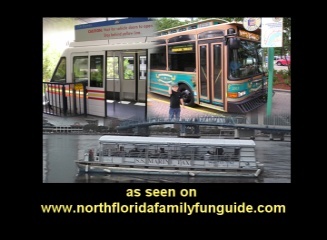 Check out www.jaxwatertaxi.com or call them at (904) 733-7782 for everything you need to know before you go! Coming back to the Jacksonville Landing we just had to stop at the Toy Factory toy store, and buy an animal balloon kit, and then get an ice cream cone inside the mall at Edy's! I managed to tire Bryan out today! Have you ever seen a kid fall asleep with an ice cream cone in his hand? Kerplunk! Too cute! I recommend this adventure! It's fun, safe, and educational! Another way to do this, would be to park across from the Museum Of Science And History, and board the Water Taxi riverside at Friendship Park, and do the tour. It will save you parking fees! Tip: Parking fees in the Jacksonville Landing lot are reduced to $5 flat fee after 5pm. Tip: There is a bathroom in the Food Court, and at Wachovia bank, as well as a drinking fountain. Tip: All other Trolleys throughout the downtown area are free to ride, only the Riverside Trolley is .50 per person.